the proper ending’. Bringing back things just gives you sequel-itis. Report by Dan Martin – follow on Twitter HERE. And if you're really missing the Ponds you can read the ongoing Doctor Who comic from IDW! Lots of Pond/Doctor fun to be had! And the latest story arc has the return of Lady Christina de Souza! 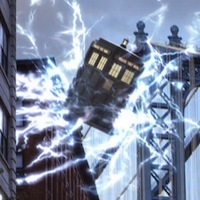 Ok, now explain why the TARDIS was exploding in series 5. Still waiting for an answer on that! They explained it in the trenzalore episode. I had my own idea. They could travel to Washington or Boston or even just wait a few years in New York and then he could show up and rescue them. That would mean they'd be older. On top of the ethical quandry about going back and rescuing them when there's a very real chance of creating an unsolvable paradox that rips Earth's history apart, it's well established in this episode that the Doctor doesn't like seeing his companions get older. They're already visibly aging. "I don't like them, they make your eyes look all liney," and then he learns it's not the reading glasses that she suddenly needs, it's that she really is developing wrinkles. And he's just had a lesson in the inadvisability of changing history; he wasn't able to prevent River breaking her arm. And he still felt guilty about it. He hates endings. "Never let him see you age." Saving them here would've been extremely dangerous and risky . . . and he'd still have to face an ending again, and he'd see them older, and lose them again anyway. Thought the same thing about New York burning even if they moved somewhere else to rationalise the entire thing. 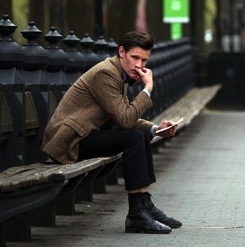 It makes sense that New York would still burn and that he would never be able to see Amy and Rory again. Karen did say she wanted a proper send off with a proper death. Nice to know that I was thinking along the same length as Steven on this one. Seems kinda unfair though for the Ponds to not at least be in the Anniversary Special this year, with the Doctor's name being revealed (or something along those lines). Amy and Rory had been with the Doctor at the beginning of the whole mystery, they deserve to be there with him when the secret's revealed. I find it amusing how some fans can't let certain companions go. (Or Doctors for that matter). Certainly a far cry from the days when companions often stayed only for a season, or not even a complete season (see, for example, Dodo, or Katarina, or even Adric, who never had a complete single season). Characters and Doctors come and go, and that's how the show has survived 50 years. If you keep looking backwards, the show will not progress. The world won't implode if the Ponds, or Rose, or Romana for that matter never appears on the show again. When Clara's story arc is properly finished, it'll be time for her to go too – and whether that's the end of Series 7 or she sticks around for a while, it depends on whether Moffat has things left to do with her. Meh. Still not quite buying it. The Doctor's going to continue traveling in time, and Amy & Rory being Amy & Rory, it's unlikely they'd stay in one place the rest of their lives, either. So if they accidentally bump into each other, the world blows up? Shaky storytelling there, Moffat. It could have been worse, the Ponds could have had their minds erased because of reasons contradicted by the very same story, and dropped back off on Earth as though nothing they'd learned or experienced in their travels with the Doctor mattered anymore. Anonymous — Adric did have a full season's worth of episodes. He had five serials (out of seven) in Season 18, while he was a companion for 6 (out of seven) serials in Season 19 — but actually did make a brief appearance in the final serial of Season 19 ("Time-Flight") as an apparition used to try and trick Tegan and Nyssa.